It’s called the Z Ring, and it’s supposed to be worn while playing Sun and Moon. Japanese toy-maker Takara Tomy is releasing the kiddy-friendly peripheral. 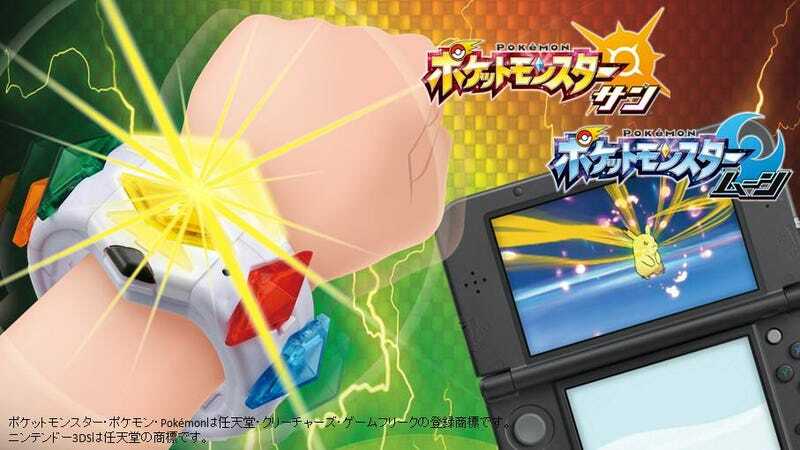 Children wear the bracelet, which blinks, makes noise and vibrates when characters do in-game Z-moves that can be unleashed only once per battle. There are 18 different Z Ring crystals kids can collect, and they all seem to correspond to a different Z-move. The Z Ring is priced at 2,600 yen (US$25.60) and comes with one Z Crystal. Each set of Z Crystals is 599 yen ($5.90) and comes with three different crystals. There is a special bundle that includes the Z Ring and six Z Crystals for 4,490 yen ($44.19). This seems like it’s taking a page from Yokai Watch’s business playbook, but will likely be the hot toy will it launches in Japan on November 18 when Sun and Moon are released. No word yet on an international release. August 2 5:21am Update: Sun and Moon’s international site also lists the Z Ring, so expect a worldwide release.